"And He Strikes Like a Thunderball" Part 2 of 2. Script by Roger Stern. Art by John Romita Jr. (breakdowns) and Brett Breeding (finishes). Cover by John Romita Jr. and Terry Austin. Much to his chagrin, the web-slinger's journey to Long Island has not uncovered the Hobgoblin; but instead an Asgardian-powered super-villain! Thunderball! Wow, one of the members on the Wrecking Crew! 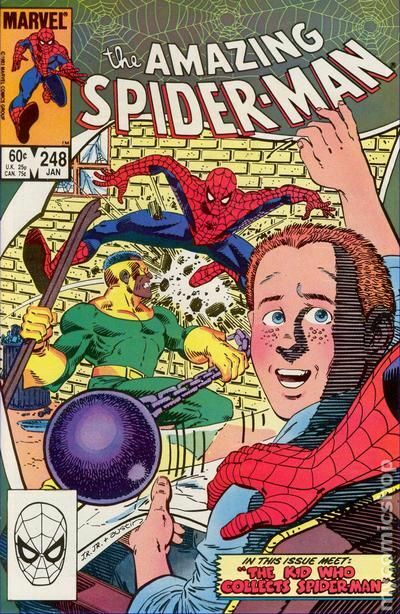 With the Wrecker's crowbar and his own ball & chain, the mighty Thunderball takes dead aim on the wall-crawler! But the quick-thinking Spider-Man jumps inside a LILCO substation and sets a high voltage trap! Can the web-slinger give Thunderball the shock of his life? Second story: "The Kid Who Collects Spider-Man!" Script by Roger Stern. Art by Ron Frenz (breakdowns) and Terry Austin (finishes). One of the most cherished stories in the annals of the Amazing Spider-Man! The web-slinger visits a terminally ill leukemia patient to make his wish come true! Brief retelling of Spider-Man's origin. Flashback cameos by Aunt May and Uncle Ben. (Notes: Thunderball previously appeared in Iron Man 171. The second story was reprinted in 1994 in the trade paperback: The Very Best of Spider-Man.) Cover price $0.60. Mark Jeweler Advertisement Insert Variant. Thunderball attacks Spidey in "And He Strikes Like a Thunderball." Script by Roger Stern, breakdowns by John Romita Jr., finishes by Brett Breeding. What this issue is best-known for is the famous ten-page back-up story, "The Kid Who Collects Spider-Man!" Script by Stern, breakdowns by Ron Frenz, finishes by Terry Austin. Romita Jr./Austin cover. Cover price $0.60. Canadian Edition with 75¢ Cover Price. "And He Strikes Like a Thunderball" Part 2 of 2. Script by Roger Stern. Art by John Romita Jr. (breakdowns) and Brett Breeding (finishes). Cover by John Romita Jr. and Terry Austin. Much to his chagrin, the web-slinger's journey to Long Island has not uncovered the Hobgoblin; but instead an Asgardian-powered super-villain! Thunderball! Wow, one of the members on the Wrecking Crew! With the Wrecker's crowbar and his own ball & chain, the mighty Thunderball takes dead aim on the wall-crawler! But the quick-thinking Spider-Man jumps inside a LILCO substation and sets a high voltage trap! Can the web-slinger give Thunderball the shock of his life? 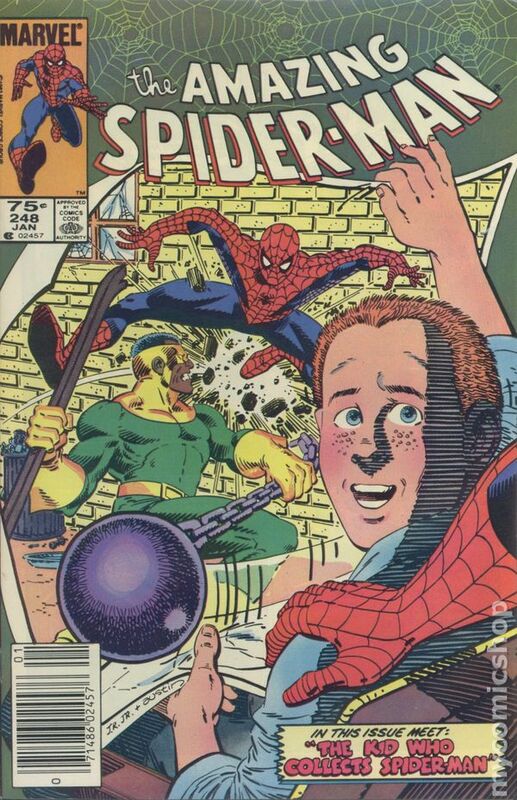 Second story: "The Kid Who Collects Spider-Man!" Script by Roger Stern. Art by Ron Frenz (breakdowns) and Terry Austin (finishes). One of the most cherished stories in the annals of the Amazing Spider-Man! The web-slinger visits a terminally ill leukemia patient to make his wish come true! Brief retelling of Spider-Man's origin. Flashback cameos by Aunt May and Uncle Ben. (Notes: Thunderball previously appeared in Iron Man 171. The second story was reprinted in 1994 in the trade paperback: The Very Best of Spider-Man.) Cover price $0.75.